As the growing season ends and garden clean up begins, perhaps the spent sunflower stalks are eyed with disinterest because there is no apparent value in their long and sturdy stalks. Take another look with the compost bin in mind. Using sunflower stalks to form the base of a compost pile will provide beneficial aeration to allow the compost to breathe within the materials. Cut off the sunflower stalks at the soil level using lopper shears. Choose a spot for the compost heap that receives full sunlight. Place a wooden palette in this spot. Place the sunflower stalks onto the wooden palette. Lay the stalks across the palette in one direction, spacing them approximately 4 inches apart. Then lay the stalks across the palette in the opposite direction, spacing them the same distance. Create a 4-inch-high layer of sunflower stalks. 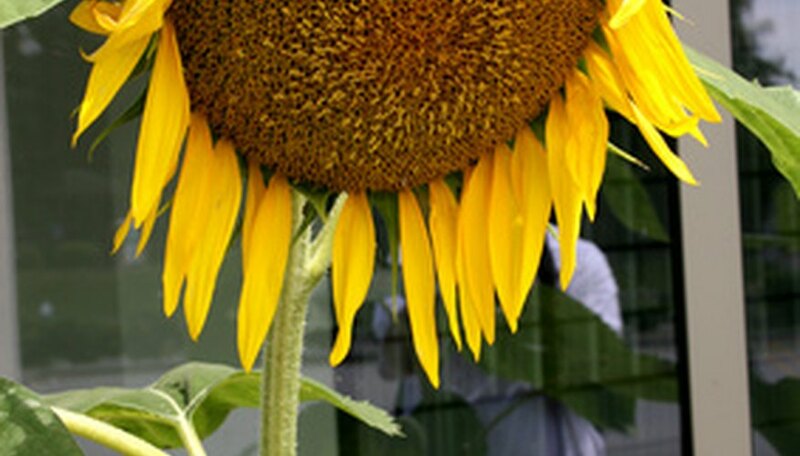 Add a 12-inch-high layer of grass and leaves directly over the sunflower stalks. Place ¼ of an inch of topsoil over the grass and leaves, spreading it evenly. Add another layer of sunflower stalks in the same fashion, except make this layer 2 inches high. Add another layer of grass and leaves, making this layer half as high (6 inches) as the first layer. Add a second ¼-inch layer of top soil. Repeat Step 7 to make the compost heap as high as you desire.